It can be such a drag to want to do something new but be afraid to start, especially when you’re over 50. It doesn’t even make much sense when you think about it. But…so many of us all procrastinate doing things we WANT to do. You consume or buy lots of stuff (like courses, clothes, books, etc) that are related to starting. You tell others about wanting to starting doing whatever it is, and then feel bad that you haven’t started yet. You find yourself thinking that you SHOULD start, but don’t. I noticed that I was falling into this trap when it came to running. I talked about it for a few years. I thought it woulld be a good fit for me. I loved the idea of not having to pay a lot of money for equipment to start. I even paid a monthly fee to be part of an online running group. BUT I did NOT RUN. This girl was perfecting the art of being a LURKER. Being a life coach myself, I knew I couldn’t just gloss over the whole thing. I had to ask myself what was going on and take a look inside my brain. Of course, this is always a good idea when you catch yourself with an outcome that you don’t actually want in your life. The first thing you have to do is notice what’s going up there. You know, up there in your mind. Without judgement, just take a look. A thought download is pretty much a thought dump. Just get it out of your brain and onto the paper. Without criticism or drama. Just words and sentences from your brain. Then, take a look at what you wrote. Separate it out into THOUGHTS and CIRCUMSTANCES. A CIRCUMSTANCE is something that is factual. If you and your buddies were all together, EVERYONE would agree. It’s black and white. Like this for example: it’s 78 degrees outside today. Or, I work 5 days a week from 9 am – 5 pm. Or, I weigh 140 lbs. Those are all facts. THOUGHTS, on the other hand, are sentences in your mind. Things you THINK about the circumstances. And this is where you want to go. What are you thinking? The thing that is so amazing about thoughts is that they’re optional and subjective. You can think what you want. The reason it’s so important to see what’s going on up there is that thoughts create your feelings. What you’re actually choosing to think is creating emotions in your body. These emotions are driving your behavior – what you do or don’t do. Because it’s in your control, even though it doesn’t seem like it is. So if you’re feeling resistant to doing something, like running, it’s because of a thought you’re thinking. And in this case, I was feeling resistant to running. When I feel resistant, I don’t run. And the personal results I create will prove what I’m thinking. That’s the secret sauce of the universe actually. Here’s a great worksheet to help you with increasing your awareness. Now you see why it’s so important that I figure out what’s going on up there. And why you need to do the same thing! There they are. The dream stealers. The thoughts that are alive and well in your brain, are actively creating results in your life. The result of NOT STARTING to run. It’s no wonder I don’t start! Those feelings are driving my ACTION, my BEHAVIOUR…or in this case, my INACTION. And when I don’t start running as a result of all of this mind drama, what do you think my results prove? ANSWER: The thought: “I’m not like those other runners.” Can you see it? The actual thoughts you’re thinking are what stop you from moving forward. They stop me. And they stop you. Everyone. Thoughts like these stop you from doing anything that you want to do. Or not do. What can you do to start doing something new? You take a baby step. Just like when you learned to walk. You can take a baby step with your thinking. Or you can take a baby step with your DOING that will be successful when you adjust your thinking to support it. Here’s what a BABY STEP THOUGHT looks like. At The Life Coach School, we call this a BRIDGE THOUGHT. This is a thought that sets you moving in the FORWARD direction vs. the thoughts you think that keep you stuck and resistant. Practicing thoughts like these are baby steps in the right direction. This direction will get you closer to DOING what it is that you WANT to do. You can’t just snap your fingers and make it so however. But you can supervise your mind. Practicing thinking thoughts like this on purpose. 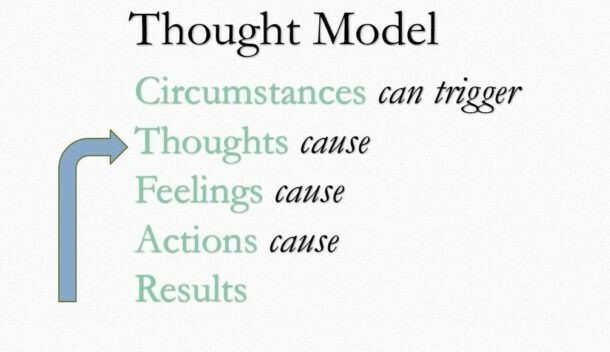 After awareness of what you’re thinking, this is the strategy that will help you create the results you’re after. The power of this work is UNBELIEVABLE. It’s a shift from feeling helpless and stuck to empowered and capable. Life coaches are like you – just humans trying to live life the best way they know how. We are open to working on ways to live more intentionally. This is one area that I’m currently working on too. And I know I love learning. I’ll be keeping you posted too! The question is: What will YOU be working on? What are you tired of procrastinating? 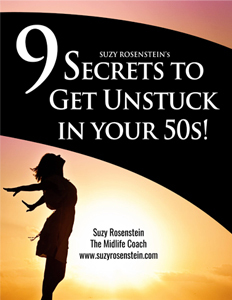 Maybe it’s time for you to bust out of your midlife funk? Check out the Women in the Middle Podcast Episode #57 It gives you an inside look into what resistance to starting something new really looks like, in my own words. In my case, it’s running, but really, it could be anything, which is why I know you’ll identify with it too. And…, it’s a different spin on an interview because I’m the one who’s going to be sharing what’s going on in my mind that’s been getting in my way. 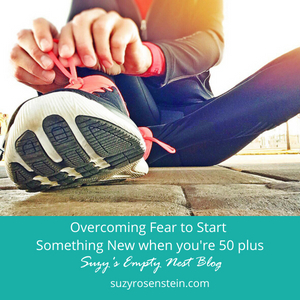 What you’ll hear is a pretty candid interview between Jill Angie, Life Coach and Running Coach at Not Your Average Runner, and ME, Suzy Rosenstein, a midlife gal who has been thinking about running for decades but is too afraid to get started. You’ll hear the thoughts, the feelings and the plans for how to think through how to get started. If you’re dealing with procrastination, fear and overwhelm yourself, it will be super easy for you to tap into these insights and apply them personally. Is it finally time to put an end to fear and procrastination in your life too? Are you ready to turn your old habits upside down and get going? Are you ready to stop using that narrative from your past about what you can’t do and what’s too hard? Click here to book your FREE, private, one-on-one Mini-Insight Call. Everyone can benefit from coaching! And at our age, as women in the middle, life is short, so let’s get going!